T-Mobile continues to stand out among the four major US carriers with their newest introduction, T-Mobile Money. This mobile banking initiative from the Un-carrier promises high-interest rates on your deposits and no pesky fees. This isn't the first time T-Mobile has attempted to offer a banking service. Four years ago we saw the introduction of T-Mobile Mobile Money - A Visa card which offered $0 purchase fees, no monthly maintenance fee, no fee to reload the card in a T-Mobile store, and $0 withdrawal fee on ATMs coast to coast ($2 charge for out of network transactions). Unfortunately, that service was discontinued after two years. According to SlashGear, T-Mobile Money comes from a partnership with BankMobile, a company specialized in mobile banking apps, to offer customers easy and convenient banking services on their phones. T-Mobile Money won't be offering customers loans or credit cards, instead, users get a MasterCard debit card which uses the money you have deposited into your T-Mobile Money account. 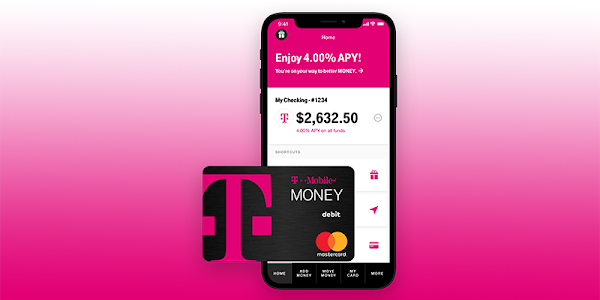 In order to encourage depositing your money into T-Mobile Money, the carrier is offering up to 4% Annual Percentage Yield (APY) for T-Mobile wireless customers who deposit at least $200 a month and maintain a balance under $3,000. If you are not a customer of the carrier, you can still earn a 1.00% APY. T-Mobile is also getting rid of all the fees that often cause bank customers frustration. This means you won't have any overdraft fee, account fee, maintenance fee, minimum balance fee, and even ATM fees at Allpoint ATMs. T-Mobile Money also offers support for Apple Pay, Google Pay and Samsung Pay which is great considering its only for smartphone users.